We love Twitter, but sometimes 140 characters simply doesn't do it. 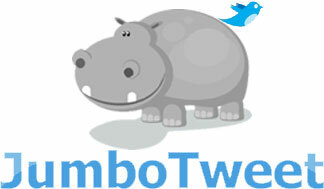 JumboTweet let's you write longer post messages, and engage in more meaningful interactions - express yourself fully, and let Jumbo deal with moving your news around! How do I write longer tweets? Jumbotweet takes your post, makes it available without any character limitation on Jumbotweet.com and automatically posts a link on Twitter with the first 140 characters minus the amount of characters required to link back to the full post. Is it safe to write longer tweets? You are always authenticating securely through Twitter's authentication service so that your account is protected and no one can ever post on your behalf. Yes, this is a completely free service that has been running since 2009. Enjoy!